This vacation rental provides genuine western hospitality while ensuring that you have all of the comforts of home in our rustic, yet refined, accommodations. Ideally situated at the base of the breathtaking Bridger Mountains, just outside of Bozeman, Montana, you will find a relaxing vacation get-a-way... The Barn. We are equipped to provide the true Montana experience, helping you find the best places to experience the area's recreational opportunities. We arrange horseback rides, pack trips, hunting and fishing trips. We can even board your horses while you stay. As a result of my three children’s involvement in 4-H, you may hear the bellar of a hungry steer or the neigh of a saddle horse. My family has enjoyed the serenity of this country life and look forward to sharing it with you. The four surrounding mountain ranges of the Gallatin Valley provide a paradise for the outdoor enthusiast. The nearby rivers and streams offer blue-ribbon fly fishing, while the mountains allow for world-class skiing. Bridger Bowl Ski Area is less than 30 minutes away, while Big Sky Ski Resort and Moonlight Basin Ski Resort are about an hour away. Hunting, hiking, biking, golfing, rafting, floating and snowmobiling are also popular activities for locals and tourists alike. And the nation's first national park, Yellowstone, is so close that you can make a day trip out of seeing the hydrothermal features and wildlife. 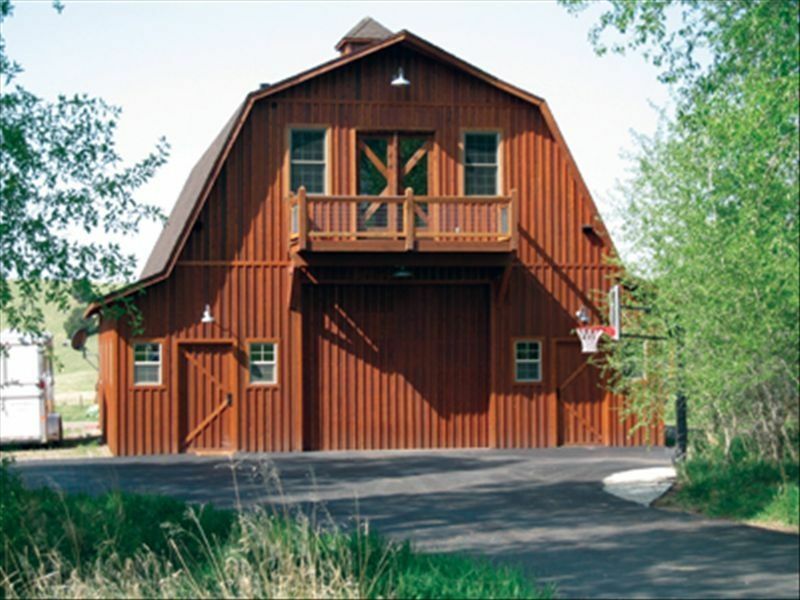 The Barn features an open floor plan with hardwood floors, custom tile, barn wood cabinets and all new appliances. Two private decks with mountain views allow for excellent star gazing beneath the big Montana sky. Completed in 2006, The Barn is fully furnished and has been tastefully decorated with custom touches that create a home away from home. Had a wonderful stay here. Val is extremely sweet and accommodating, the house was well stocked and even had extras like cookies and some bonuses in the fridge! Took us 40 minutes to get to Bridger Bowl and it's an easy drive. Overall fantastic, highly recommend! Absolutely loved our stay here. It is warm and charming. Everything about this place is wonderful. It is a quality home and so comfortable. Val took care of us from beginning to end. So many thoughtful goodies as well as a few Christmas decorations, including a small tree. (She asked us if we would enjoy this before doing it). I will definitely be staying here again. Impeccable retreat with killer views! This great hideaway nestled in the loft of a quintessential classic barn is right out of a magazine! Everything is quality about this place! Val met us as we rolled in and couldn't have been more gracious. Everything we needed for our stay could be found in this loft condo. There is a great rustic custom built dining table not pictured that we used a lot. All of the cupboards, kitchen island, TV hutch, closet built-ins, dining table, etc were custom built by a local finisher! They were outstanding! The pictures on the site do not do it justice. There is a second bedroom with the hide-abed that also was not pictured. The views from the huge master bedroom took our breath away! I could go on and on! We can't wait to stay here again. It was a great experience. Thank you Val for making our stay one we will never forget!!! Nothing but good and positive things to say about the Barn, the location, and the owner (Val). Upon arrival Val was waiting with a genuinely friendly smile and a loaf of perfectly moist, fresh banana bread. My wife, our 2.5 year old little girl and I had quite the adventure over a course of 7 days. We only wish we could have stayed longer. The location is quiet and feels secluded but you are only a stones throw from Downtown Bozeman, and it serves as a great base camp to explore in and around Bozeman. We were able to float the lower Madison for a half day of fishing, day trip to Gardiner and Yellowstone National Park, explore trails and waterfalls outside of Livingston, fish the Yellowstone river, visit the Museum of the Rockies, explore Hyalite Canyon and Reservoir, see Palisade falls, and much more, and still return every evening for "farm time" where our little one loved petting the resident barn cats, the horses and the baby cows and talking to "Ms. Val." We explored back roads and saw a herd of Elk that had come down from the nearby Bridger Mountains (which serve as an amazing backdrop view from the Barn). I could go on and on. If you're considering booking, just do it. You'll be thankful you did. It was perfect for our little family! Thanks again Val! I enjoyed having you stay and experience country life at the "Barn"! We look forward to seeing you again to experience life in "Big Sky country!" A perfect slice of heaven! Where do I begin.... We pulled into Val’s magnificent ranch and from her very first friendly smile and warm greeting we knew we would have a wonderful month ahead. When we stepped into the apartment we were in for a further surprise. The space was large and beautifully appointed in a modern style with rustic touches throughout. (the photos can’t even begin to show how truly spectacular the place is) No expense was spared on the finishes. Firm mattress, soft linens, high end appliances, SAT t.v., and every conceivable kitchen gadget/appliance, etc., etc.!!! As for the location it is perfect. The ranch is surrounded with mountain and valley views, grazing cattle, horses, sheep, and fields of hay and golden barley. It’s a short 15-20 minute drive to Bozeman or Belgrade, both towns full of great restaurants and many fun activities. We loved the ease of biking and hiking along many trails and roadways. I could go on and on but nothing I can say really does this perfect gem justice. We will be returning for another visit in the near future. I now call Val my good friend. Her farm animals are loved like members of her own family and consequently that’s how she made us feel, too. I love sharing the "barn" with wonderful people like you! The Gallatin Valley is truly a place to behold.! The Barn was an exceptional place to stay. Perfect for those who rather have peace and quite and a place to ride a horse. Hospitality was great from the owner. I enjoyed having your family stay at the "barn" in the Gallatin Valley of Montana!! Horse rental or horse boarding available. Guided fishing or mountain trips available.